In Maryland, a "limited divorce" is the equivalent of a legal separation in many other states. A limited divorce will allow you and your spouse to negotiate many of the legal issues relevant to ending a marriage, but a judgment of limited divorce will not allow you to remarry. Some couples choose limited divorce because they do not yet meet the requirements to obtain an absolute divorce, which permanently ends a marriage and allows remarriage to others. However, you can also choose limited divorce if you do not intend to get an absolute divorce in the future. 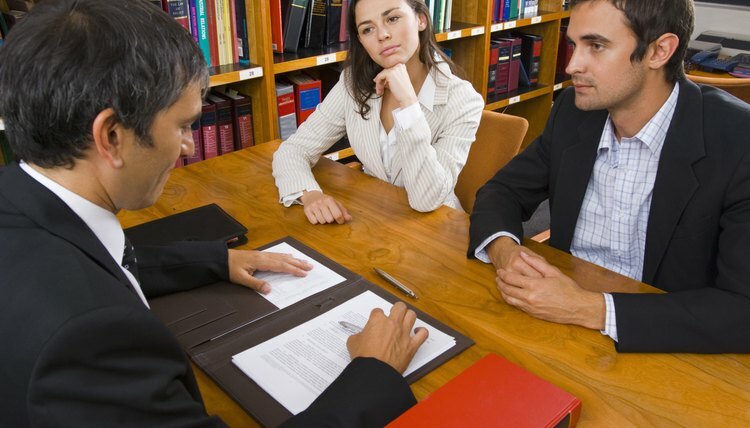 Confirm that you meet the residency requirements to file for a limited divorce in Maryland. Under state law, you must have lived in Maryland for at least one year or be able to prove that the grounds for a limited divorce happened in Maryland. File for a limited divorce in the county where you live or county where your spouse lives, owns a business or is employed. Identify the grounds for limited divorce that apply to your personal situation. Maryland allows a limited divorce under the following circumstances: voluntary and mutual separation, cruel treatment, excessively vicious conduct and desertion. Obtain the Maryland court forms required to file for a limited divorce — the state has separate forms for limited divorce and absolute divorce. Prepare and file the forms with the circuit court in one of the counties where you qualify to file for divorce. Attempt to negotiate a separation agreement with your spouse to establish your legal rights regarding issues such as property distribution, alimony and child custody. Participate in mediation services, if available, to see if you can bridge your differences. Ask the court to incorporate the separation agreement, signed by you and your spouse, into the divorce decree if you have been able to negotiate some of the legal issues for your divorce successfully. Attend the court dates scheduled for your case. Request a decree of limited divorce from the court. If granted, the decree has the effect of a legal separation between spouses. A limited partnership must have at least one limited partner and one general partner. Limited partners do not usually participate in the management of the partnership and are only liable for the partnership's debts equal to their investments in the partnership. General partners typically run the limited partnership and have unlimited liability. There are several steps the partners must take to dissolve a limited partnership. At first glance, Maryland seems to offer a lot of different ways to divorce, but it's not really that much more creative than other states. The Annotated Code of Maryland governs divorces in each of the state's counties, so Baltimore isn't unique from other locations. The Circuit Court in Baltimore City accepts divorce filings, and you can file there if either you or your spouse resides, owns a business or is employed in the city. Either you or your spouse must have lived in the state for a year. What Is a Limited Divorce in Maryland? Why Would Someone Want a Limited Divorce?